In the wake of the 2016 presidential election, many people, on the left and right alike, came together on the internet to express a united sentiment: that the media had called the election wrong. In particular, one man may have received the brunt of this negative attention. 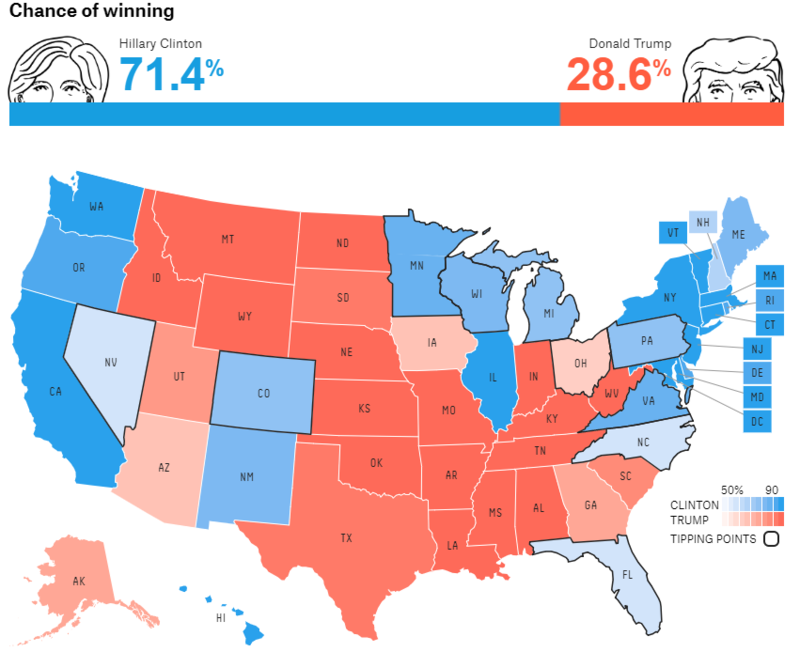 Nate Silver and his website FiveThirtyEight have taken nearly endless flak from disgruntled Twitter users over the past two years for their forecast which gave Hillary Clinton a 71.4% chance of winning. However, as Nate Silver has argued in many articles and tweets, he did not call the race “wrong” at all, everyone else just misinterpreted his forecast. So what really happened? How could Nate Silver say that he wasn’t wrong when so many believe to this day that he was? As believers in good data visualization practice, we here in the Scholarly Commons can tell you that if everyone interprets your data to mean one thing when you really meant it to convey something else entirely, your visualization may be the problem. Today is Election Day, and once again, FiveThirtyEight has new models out forecasting the various House, Senate, and Governors races on the ballot. However, these models look quite a bit different from 2016’s, and in those differences lie some important data viz lessons. Let’s dive in and see what we can see! 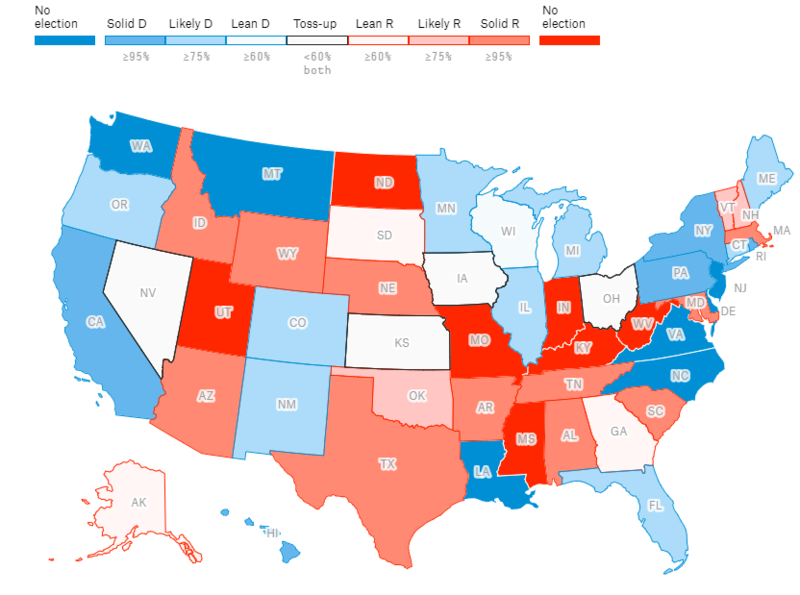 The image above is a screenshot taken from the very top of the page for FiveThirtyEight’s 2016 Presidential Election Forecast, which was last updated on the morning of Election Day 2016. The image shows a bar across the top, filled in blue 71.4% of the way, to represent Clinton’s chance of winning, and red the rest of the 28.6% to represent Trump’s chance of winning. Below this bar is a map of the fifty states, colored from dark red to light red to light blue to dark blue, representative of the percentage chance that each state goes for one of the two candidates. The model also allows you to get a sense of where exactly each state stands, by hovering your cursor over a particular state. In the above example, we can see a bar similar the one at the top of the national forecast which shows Clinton’s 55.1% chance of winning Florida. The top line of FiveThirtyEight’s 2018 predictions looks quite a bit different. 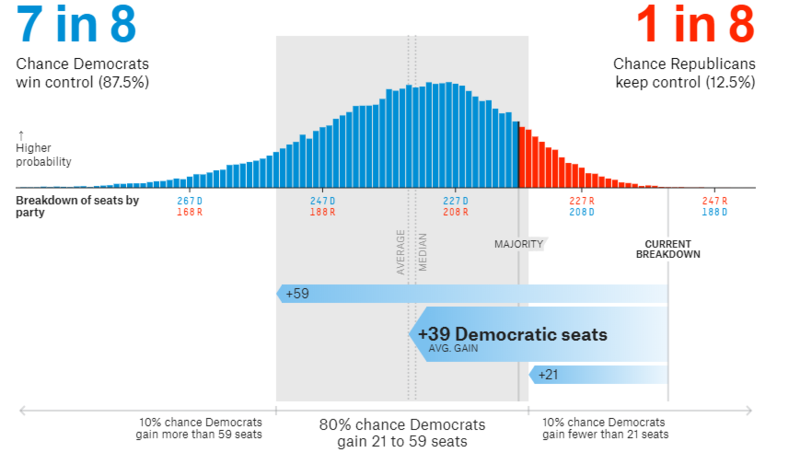 When you open the House or Senate forecasts, the first thing you see is a bell curve, not a map, as exemplified by the image of the House forecast below. At first glance, this image may be more difficult to take in than a simple map, but it actually contains a lot of information that is essential to anyone hoping to get a sense of where the election stands. First, the top-line likelihood of each party taking control is expressed as a fraction, rather than as a percent. The reasoning behind this is that some feel that the percent bar from the 2016 model improperly gave the sense that Clinton’s win was a sure thing. The editors at FiveThirtyEight hope that fractions will do a better job than percentages at conveying that the forecasted outcome is not a sure thing. 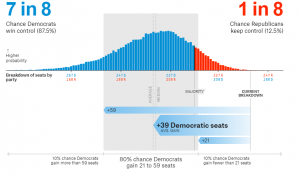 Beyond this, the bell curve shows forecasted percentage chances for every possible outcome (for example, at the time of writing, this, there is a 2.8% chance that Democrats gain 37 seats, a 1.6% chance that Democrats gain 20 seats, a <0.1% chance that Democrats gain 97 seats, and a <0.1% chance that Republicans gain 12 seats. This visualization shows the inner workings of how the model makes its prediction. Importantly, it strikes home the idea that any result could happen even if one end result is considered more likely. What’s more, the model features a gray rectangle centered around the average result, that highlights the middle 80% of the forecast: there is an 80% chance that the result will be between a Democratic gain of 20 seats (meaning Republicans would hold the House) and a Democratic gain of 54 (a so-called “blue wave”). The 2018 models do feature maps as well, such as the above map for the Governors forecast. But some distinct changes have been made. First, you have to scroll down to get to the map, hopefully absorbing some important information from the graphs at the top in the meantime. Most prominently, FiveThirtyEight has re-thought the color palette they are using. Whereas the 2016 forecast only featured shades of red and blue, this year the models use gray (House) and white (Senate and Governors) to represent toss-ups and races that only slightly lean one way or the other. If this color scheme had been used in 2016, North Carolina and Florida, both states that ended up going for Trump but were colored blue on the map, would have been much more accurately depicted not as “blue states” but as toss-ups. Once again, hovering over a state or district gives you a detail of the forecast for that place in particular, but FiveThirtyEight has improved that as well. Here we can see much more information than was provided in the hover-over function for the 2016 map. Perhaps most importantly, this screen shows us the forecasted vote share for each candidate, including the average, high, and low ends of the prediction. So for example, from the above screenshot for Illinois’ 13th Congressional District (home to the University of Illinois!) we can see that Rodney Davis is projected to win, but there is a very real scenario in which Betsy Dirksen Londrigan ends up beating him. FiveThirtyEight did not significantly change how their models make predictions between 2016 and this year. The data itself is treated in roughly the same way. But as we can see from these comparisons, the way that this data is presented can make a big difference in terms of how we interpret it. Will these efforts at better data visualization be enough to deter angry reactions to how the model correlates with actual election results? We’ll just have to tune in to the replies on Nate Silver’s twitter account tomorrow morning to find out… In the meantime, check out their House, Senate, and Governors forecasts for yourself! All screenshots taken from fivethirtyeight.com. Images of the 2016 models reflect the “Polls-only” forecast. Images of the 2018 models reflect the “Classic” forecasts as of the end of the day on November 5th 2018. This entry was posted in Data Services, Data Visualization and tagged Data Visualization, Data Viz, fivethirtyeight by Michael Robert Cummings. Bookmark the permalink.